Michelle Obama met with students and parents at T.C Williams High School in Virginia to discuss the importance of students filling FAFSA applications. Washington (CNN) - For students wondering how they’ll pay for college, First Lady Michelle Obama has a bit of advice: applying for federal student aid is easy and worth it. Speaking in Alexandria, Virginia’s T.C. Williams High School, Mrs. Obama and Education Secretary Arne Duncan encouraged a group of high school students to fill out the Free Application for Federal Student Aid. Wednesday’s event was part of a major push by the Department of Education, which partnered with Viacom and Get Schooled, to make sure students don’t let the growing costs of higher education discourage them applying to college. To keep students engaged, Duncan said the Department of Education has been working to simplify the once-tedious application process, cutting the average amount of time it takes to complete the forms down to less than 30 minutes. The agency is also provides information about FAFSA on Twitter and at StudentAid.gov. According to the Department of Education, more than 14 million students receive federal student aid annually to help cover the costs of tuition, fees, books, room and board, dependent care, and more. The department says that most students are eligible for some degree of aid. Race, gender, and field of study don’t affect eligibility. And, while income is considered, it does not automatically disqualify applicants. In addition to federal student aid, prospective students are also encouraged to look into financial aid from states, schools and non-profit organizations. 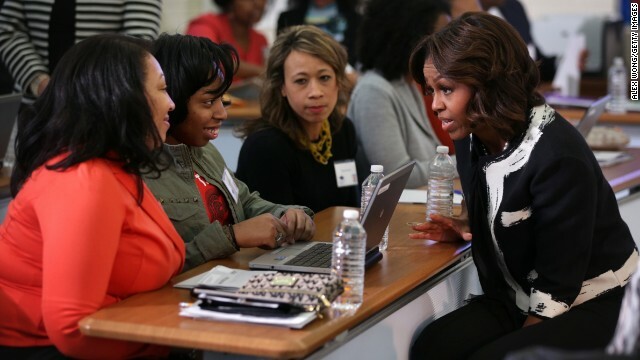 During Wednesday’s program, Mrs. Obama stopped by each table while students and their parents worked with counselors to fill out their own FAFSA applications. The program also included several Get Schooled video clips which featured encouraging works from blockbuster recording artists like Common and Kendrick Lamar. As for the school itself, Duncan touted it as a model for other high schools due to its high counselor-to-student ratio as well as the school’s efforts to ensure all students apply to college. According to Alexandria City Public Schools Communications and Public Relations Director Kelly Alexander, the school is committed to seeing that all of their roughly 3,300 students fill out their FAFSA forms. CNN”s Eddie Gross contributed to this report. Filling out freebies? What about getting a job and save for a few years then you might have a better idea what you want to make of your life. Starting out with gifts and grants and so forth send the wrong message to our youth. A little hard work early in life sometime give a better understanding than 2 years in college. Sounds like very sound advise to me. You could get the same advise from most High School Counselors. Whats the problem with that? I know plenty of students with republican parents getting grants . If the program is their take advantage. It is not a hand out . These kids work hard and as a society we all benefit. This should not be a political issue at all. I encouraged the same to both my sons, and I was encouraged to do the same by my college counselor. There is no need for students to be encumbered with mulitple loans when there are so many different scholarships and grants both private and government that they might qualify for depending on their grades, heritage, major and other factors. So many perspective college students saddle themselves in loan debt unnecessarily, or even pass up attending the college of their choice because they think they're unable to afford it. Applying for college must be done with diligence and with ample time and determination to explore every possible source of income that a student may qualify for. Parents and students owe it to themselves to do so. With Liberals running country that all money you probably ever see. Learn flip hamburgers. Even better learn to work! Sonnie3- if that is what you did, then pat yourself on the back. Most kids do work while going to school. Are you suggesting they work full time or part time? Also, there is a life experience that happens when going to college as a young adult. People seem to think that experience doesn't also make a person grow and realize what they want to do. We should be providing free college to our students, like most 1st world countries. Give to me, all that is free. This article served as one purpose and one purpose only..... Red meat for the salivating right wing wolves. Maybe while the First Lady has their attention, she could remind the students to Register AND Vote! Maybe even, she and Ms Biden (aka Dr Jill) could start a campaign educating Dems on Absentee Voting. Red states are in a campaign to cut back on early voting, and a good way around that is absentee ballots. Plus, since AV is mostly used by older republicans, it will really mess with them for Dems to indulge!! And come to Georgia; get em fired up down here. The poles here are empty on off-year elections. Yes, by all means, take, take, take and take until there is no more to take. It is the Democrat way. If it would be in third word country ! There are more jobs for people to work while they are in college and anyone who can get loan assistance needs to go for it! College is expensive and these loans Mrs. Obama are talking about are available. Fast food jobs, daycares, retail jobs ect.. anything is better than no money at all and being broke while in college. Not everyone comes from a wealthy family. These are free for the applying, it just all takes time but worth it in the end if you qualify for some form of assistance.